Sean Kelly Gallery is pleased to announce the exhibition, upon reflection.... The exhibition will open on January 10th and close on February 15. upon reflection.…brings together works in diverse media that either utilize reflective materials or that employ references to reflection. Mirrors and reflective surfaces have historically had a variety of associations, including most prominently, self-perception, identity, memory and morality. Joseph Kosuth's Any seven foot sheet of glass to lean against any wall., 1965 is just that, a 7 foot square sheet of glass leaning against the wall with an accompanying plaque. Restless 17 by Iran do Espírito Santo is a sheet of glass with various reflective surfaces comprised of frosted, mirrored and blackened areas, which makes use of reflective surfaces to invoke a sense of displacement in the viewer. Donkey, a high chromium stainless steel silhouette of a donkey's head by Jeff Koons, and Richard Rezac's untitled, a nickel plated bronze slice of Swiss cheese, use humor to negotiate the complex issues of mirrors. Douglas Gordon's Retrace your Steps / Remember Tomorrow, 1999 is 5 foot square mirror with texts that read "Retrace your Steps" and "Remember Tomorrow" in reverse. 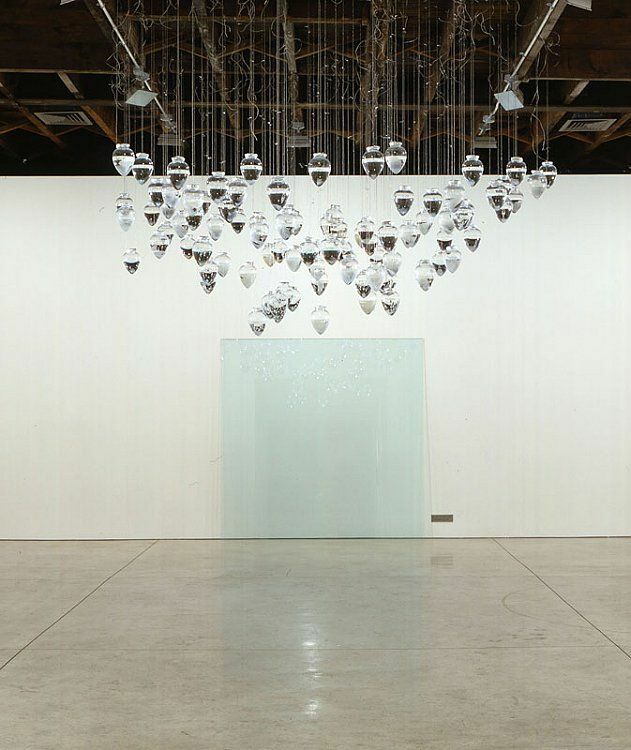 In Spirit Collection: Hippocrates, 1999, by Christine Borland, numerous drop-shaped glass containers are filled with single bleached skeletal leaves, floating in a clear liquid solution. The leaves originate from a tree grown from the seed of a Plane tree from Kos in Greece, under which Hippocrates, the father of medicine, taught his first students. A metaphorical descendent of the tree of knowledge, this sapling physically embodies the epitome of the Hippocratic oath, and alludes to the complexities of exploring the family tree – the starting point of all genetic research. Four Flooded Arches from Right, 1999 by James Casebere focuses on the relationship between social control and societal structure. 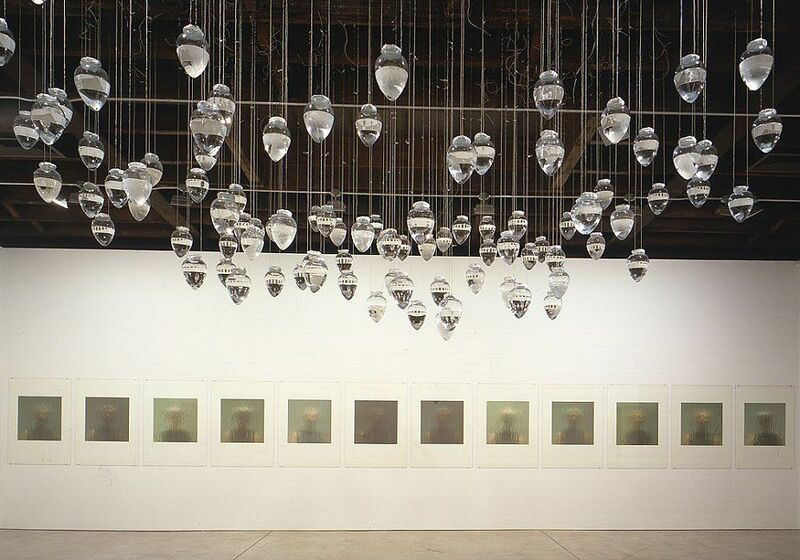 For her reflections series, 1999/2000 Ann Hamilton stood behind a wall of "water glass" and had her photograph taken every 5 minutes for an hour, each image ameliorated only by the changing light. In Where Speech Could Have Been Transcribed, 2001, by Julião Sarmento two female figures, who may or may not be he same character, sit at opposite sides of a table with an object between them which may, or may not be, a mirror. The viewer's role in completing the narrative is essential. Robert Smithson's Mirror Displacement, 1969, is six black and white photographs taken with a Brownie camera of a mirror, placed in various locations on a snowy rooftop. In the Douglas Gordon video Making of the Monster, 1995 the artist alters his appearance with tape while looking in his bathroom mirror. Pia Stadtbaümer investigates themes of childhood, storytelling fragmentation and appropriation, while addressing issues of individuality, physicality, and the human form in Max, lamb, mirror, 2000. In Alfredo Jaar's two lightbox works It is difficult and Things fall apart the title of each work, taken from literary sources, is white against a black background, so that the viewer is literally reflected in a work that evokes deep political and moral reflection. Louise Bourgeois' The Couple, 2002, is a mirrored aluminum hanging sculpture, that depicts an entwined couple. For Marina Abramovic's Mirror for Departure, 1995 a piece of hematite was polished to create a reflective surface, in front of which sits a wooden chair, so that visitors can contemplate their own reflection. The "mirror" has the odd characteristic of appearing to reflect an interior vision of the sitter, rather than a straight forward reflection. Untitled # 97070803, 1997 a gelatin silver print by Valérie Belin of Venetian mirrors and glass objects, is a densely complex still life which recalls a momento mori.